Direct Marketing Hub is an online portal for all of your direct marketing needs. We provide the best quality printing, with unbeatable pricing and outstanding customer service! 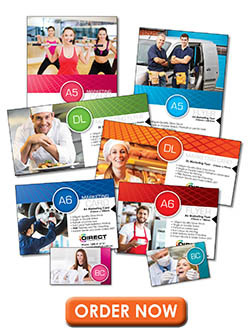 We have a large range of popular direct marketing products such as Flyers, Price Lists, Brochures, Marketing Cards, Posters, Catalogues, as well as all your stationery needs such as Business Cards, Letterheads and With Compliment Slips. You can jump onto our site 24 hours a day, 7 days a week to receive instant quotes on a range of standard products, upload your files and re-order previous items within your account when logged-in as a returning customer. Our Customer Service Department are experts in creating custom solutions for all of your marketing needs. With over 20 years in the direct marketing and printing industries we are confident in helping you achieve the best solution to get the best outcome for your business at the best price. At Direct Marketing Hub we work hard to make sure that you are kept informed throughout the whole order process with updates sent to your email to notify you of any change in status with your order. We will deliver your printing directly to your doorstep via courier within 3 to 5 business days, depending on your order. All of your previous orders and files are stored in your account, ready for you to access at any time. Just log in to your account, look up a previous job and hit print. No more hunting around for artwork or searching through your computer to find out what you ordered last time. We have tried to make the whole ordering process as easy as possible. We specialise in small and large quantities - for small, medium or large businesses, or anyone that needs assistance with their marketing. You can jump onto our site 24 hours a day, 7 days a week to receive instant quotes on a range of standard products, upload your files and re-order previous items within your account when logged-in as a returning customer. We will deliver your printing directly to your doorstep via courier within 3 to 5 business days, depending on your order. We specialise in small and large quantities - for small, medium or large businesses, or anyone that needs assistance with their marketing.